It's a given that I am a sucker for egg pies. I also have the same addiction to its cousins: egg tarts, leche flan, meringues and Brazo de Mercedes. I know that these heavenly creations are the possible causes of Diabetes, which is present in our bloodline, but i just go weak whenever I get to lay my eyes on them. Good thing I have a strong urge not to frequently stop by Lachi's or Sugar Munch - two of my favorite dessert stores located in the same street, Marfori, the one I pass by regularly going to and from my residence in Ma-a. Or should I acknowledge the blessing that God makes it easier for me to satisfy my sweet tooth cravings? Hmmm, yay! Anyways, another favorite haven for desserts here in Davao is Cecil's. They are one of the oldest establishments here which sell great tasting cakes and pastries, batchoy and pasta. My ultimate favorite is of course their Egg Pie! And by far, I can say that it is the best in the city. It's has the perfect taste which tells you that they didn't scrimp on their ingredients. It has the right amount of sweetness, plus it is not saggy and doesn't crumble down easily when you slice it. Just real egg pie goodness. It goes so well with its equally tasty pie crust. On a side note, I even sometimes wish that I can actually buy pie crusts from them and munch on it separately. That's how good it is. The next two to-die-for must haves for me are their luscious chocolate moist cake and savory palabok. Sharing now the images I took of these favorites. Haha, it's quite obvious that I really pigged out at Cecil's eh? Sorry naman, lol! I dined and took photos alone, so you can imagine how it brightened my little me-time. You too can have this indulgent treat when you're having a sugar rush anytime of the day. If you just want something to perk you up, this egg pie is definitely IT! Thankfully, I can easily say no to sweets. But that chocolate moist cake is pure temptation! Grabe, am really drooling now. Hehe. oh gee, i am getting so hungry, i miss our egg pies and the palabok, so yum!!! I never had an egg pie before, does the taste resembles to leche flan? Rcel and Betchai -- exactly, they'll always be in my top list of favorite food! Gosh! 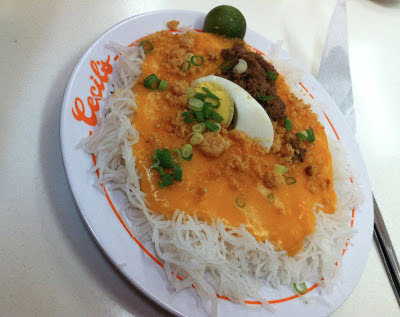 Palabok and egg pie are 2 of my most wanted foods. May Cecil din kaya sa Manila.